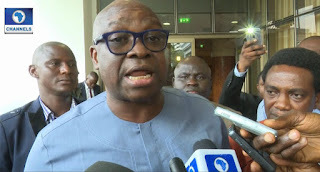 Ekiti State Governor, Ayodele Fayose had once again declared he will become president come 2019. Fayose said this while addressing a group of women for the commemoration of The International Women's Day Celebration. He said it might not look like it right but it surely going to come to pass. The political fanatits, said he would not succumb himself to any form of pressure or noise, he would rather keep clamouring for better change. Fayose also talked about the present day government, said they've stood the test of time and have failed woefully. He ended the speech by promising government support to the women and help improve the standard of living in the state. He said though this would be his last attendance as a governor, he his next visit would be from Aso Rock.